The buttons are a perfect touch. Beautiful card, Songsook... wonderful blend of materials. Sail away! 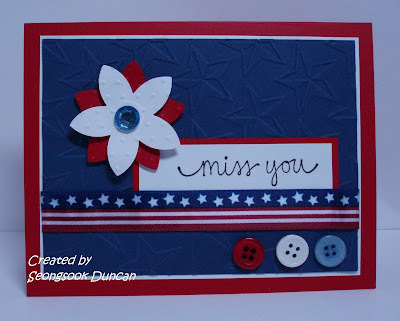 Such a cute card, I've really enjoyed seeing all the Red White Blue cards on the blog hop. Gorgeous embossing for the background. Great job! Oh, this is a beautiful card. I love the star background. TFS. Cute card!! Love all of the embossing and buttons! TFS!! And you might not have been born in the US, but I'm sure you got here as fast as you could :) And we're all glad you did! Hello, Seongsook! I remember you from last year's blog hop! Your card is really beautiful and your dedication to OWH is inspiring. what a great card ~ love the embossed background!! What a gorgeous card...very eye-catching! Great card! I love it! And, as a military wife, let me say thank you for sharing your creativity to help bring families closer who are separated by duty. You always do such beautiful work Seongsook. I love your style and I enjoy checking in on your blog regularly to see what you've done. 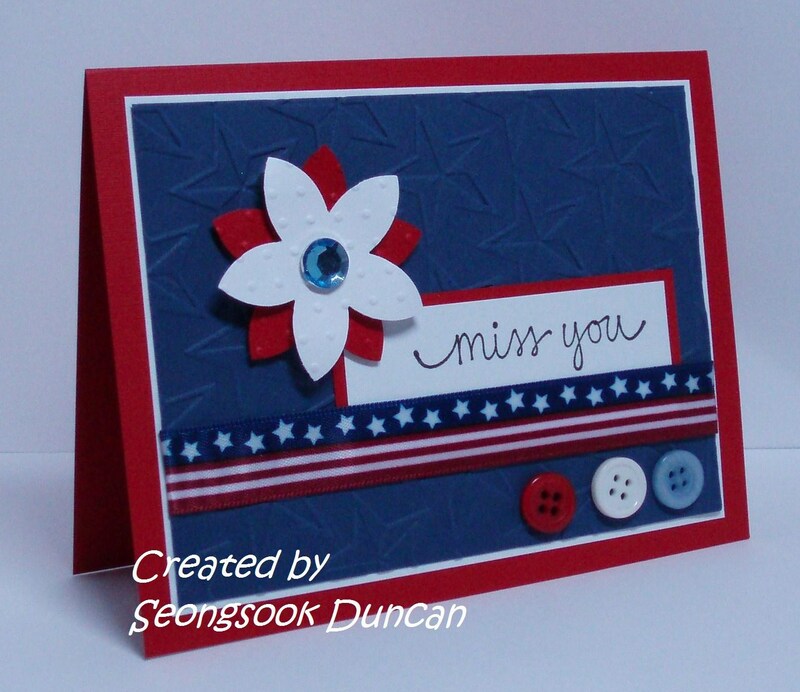 Awww Seongsook, such a sweet card - love the cuttlebugged flower, the buttons, its all such a treasure. Thanks!!!! I always look for your cards and love them! What a big heart you have. Thank you so much for being the talented, generous person you are. Thank you for supporting OWH and out troops. What a perfect card! Love all the little elements! Your card is really beautiful. I like the dry embossing for the background! Congratulations on your citizenship to the United States! I'm not sure how long ago you arrived, but I'm glad that you've jumped onto the bandwagon and helped make cards for Operation Write Home. It's an organization that truly defines the word "service' and I love how it helps support our soldiers and heroes. LOVE the textured stars background. This card is gorgeous..love the embossing! Beautiful cards for the hop. What is even more beautiful is the link to those two web sites. As Americans we have forgotten what this holiday was meant to be. Thank you for reminding me. Welcome as you become a new citizen. Love the miss you card. Your cards are beautiful as always! Love your style! I love your card! Perfect for OWH. I use that Cuttlebug stars folder a lot for OWH cards. Thanks for supporting our Heroes and OWH. I started when it was CFH too and still sometimes want to call it that! Seongsook, your cards are always terrific! I love the way you used the red and blue paper so that the white looks so crisp. You have a real eye for design and color. Thanks for your dedication to our military heroes and to OWH! Beautiful cards. Love the clean lines with the touches of embellishments. Love your card. And that background is awesome! Perfectly simple, perfectly stated card!! Congratulations on your blog anniversary! I think we both started with OWH at the same time last year. You continue to make such beautiful cards and this card is beautiful proof of the wonderful work that you create! Thanks for the offer of the blog candy! very fun cards - thanks for sharing the links for the history of Memorial Day - yesterday I heard on the radio some of the history - and my daughter and I both said - I did not know that. Your card is just lovely, and I really love that star embossing folder you used! What a fabulous look! VERY pretty cards. I love the simple yet elegant layout. TFS and participating once again in the hop - I enjoy visiting your blog. Seongsook, I love this card and how bright and vibrant the layout makes it look! Your cards are really fun! Yours is always one of my favorites along the bloghops! Thanks for sharing your great talent and thank you for the links! You are fantastic! Very cute! I love the buttons. This is so cute! I like the font you used. Is that blue star ribbon or paper? I like that too! I love using buttons on my card too ... I scrolled down and looked at some of your other creations, you are a talented card maker! thanks for sharing your blog with us on the hop! Great cards....and great CAS. I love the Buttons. Happy 1ST Blogversary! Love the card you created and of course LOVE the buttons! I really hope you got my email with the digis in there and I hope you were able to open them...take care! Love your card- simple but elegant! Great blog hop! 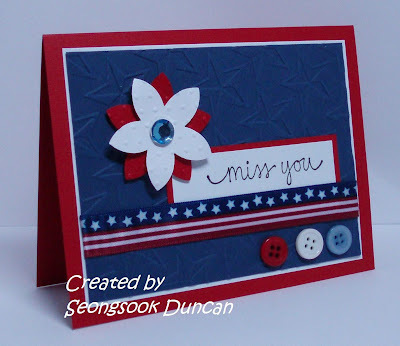 WOW - these cards are great and I love the one you did with Sandy's eagle! Beautiful cards & congrats on you 1 year anniversary! These are so strikingly beautiful. It demonstrates how the cards don't have to have lots on them to make them perfect! Your card is gorgeous! Thank you for supporting our troops! Beautiful card! You always do terrific work and I really love this one especially. Thanks for all of your inspiration and especially being involved with OWH. As always your card is beautiful!!! Love the buttons and the star embossing folder! Very elegant! Love your card creation! My husband is a vietnam veteran and said he wishes they had a program like OWH when he was overseas. Thanks for supporting our patriots through this blog hop. And thanks for sharing your talents with us! Happy Memorial Day! Your card is so cute. Love the buttons. Happy Anniversary on your blog. Happy anniversary. I feel your dedication to OWH and the US. Thank you for the history lesson. We all need to know why we celebrate this day and how we can start something in our own towns/neighborhoods. I love buttons on cards and your cards are just beautiful. COngrats on your blogaversary! Don't you just love that stars folder? Such a neat look for any hero cards. I love the star ribbon you used. It really brings out the embossed star background! happy one year anniversary on your blog! That is quite a feat. The buttons on your cards are very. Glad you are participating in the OWH blog hop! Your card is gorgeous! I love the star embossed background and the buttons add a nice finishing touch. The embossing on this card is beautiful, thanks for supporting our troops! Love the Star embossing on your BG paper. I am excited to send more cards out to OWH. I have a box ready to go. Thanks for the encouragement. I LOVE your card, it is CAS(clean and simple) yet beautiful!! (thinking)...Perhaps a touch of "stickles" or inking the edges of the flowers? I have lots of cards through out my blog in posts and I have a slide show near the bottom. I also like collage...so you may want to think about collaging some cards sometime. I like how you embossed the flowers. It's subtle but really pretty! Seongsook, I always love the look of your cards. I tend to like simplicity in a card...not too fussy, more crispness and you always come through. Thanks for sharing your creativity! That is a lovely card. I may have to case it. I have always enjoyed your cards and I can't wait to see more. Absolutely beautiful card !! I'm going to have to get some embossing supplies. Thanks for the inspiration. cute card! love the embossing. I love your card. Congratulations on your blog hop anniversary. This is my first OWH blog hop. I jumped in feet first and I'm loving it. Cute card! I love the mix of the patriotic colors and ribbon and the flower! Love your cards and gives me so much inspiration!! I thank God I found OWH to help out when I can. I can't think of anything else I would rather do. Thank you so much for sharing your work and keep them coming to OWH and us who watch your blog! Have a great Memorial weekend honoring our hero's!! I love your card! Congratulations on your one year Blog anniversary! Thanks for contributing to OWH and for joining the Hop. wow, your card is beautiful! I love the simple elegance of it. Thank you for all the support you give to our troops! And congrats on the blog anniversary!! This is a very cute card... I love that cuttlebug folder! Thanks so much for sharing... and for the links, those were great! Love your cute card! The buttons just make it perfect! Terrific card! Thanks for being a part of the hop! Beautiful card. Love your use of buttons. Love this card. Sure to make a HERO's day. A bit late to the hop, but getting around as I can.